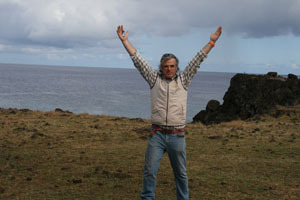 I'm pretty well settled in here, Easter Island is very very special. Safe (no crime), friendly, beautiful, the weather is pretty much perfect - in the 70's during the day - sun/clouds - can be hot in the direct sun, tshirt weather, maybe a vest or sweatshirt. And in the 50's and 60's at night - sweater in the early morning and evening, great sleeping. They don't need air conditioners or heaters here. 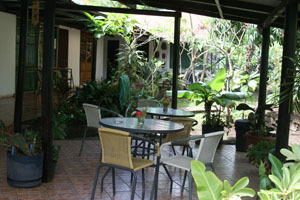 I landed at a sweet little hotel - Hotel Uka - or 'Martin & Anita's' if you ask a local. Not too fancy, but pleasant and clean and very friendly. I'm renting a car from them - they also have bikes, scooters, whatever. Business on the island is very laid back - still not much in the way of paperwork, contract, etc. Lots of dealings by talk, by friendship. Pleasantly innocent feeling. 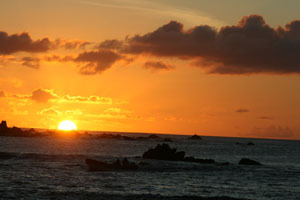 The locals, the Rapa Nui, are very distinctive. Tall in stature, the youth seem very athletic. Smiling, laid back, no worries. There are tourists - but nothing overwhelming. The island seems to absorb them easily. Most of the touring I've done I've been alone at the most incredible places - are maybe a couple other people coming through. Very spiritual here. The moai (statues) are unfathomable - huge, beautiful - and endearing! They feel more like friendly guardians than threatening guards. I'll try to write more about them when I get a chance - the how/why/when - some of which is purely theoretical (still un-answered questions) - some history they (anthropoligists, archaeologists) feel pretty certain about. I've been having a great time with Steve and Dinah - they are so pleasant, and up for any adventure! 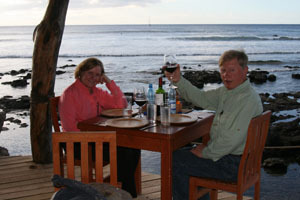 We had a nice dinner at a restaurant - La Kaleka - right on the point of the harbour at Hauna Roa (the only town on the island). Enjoying a meal and a bottle of wine and a blazing sunset - as the surfers catch the waves, the fishing and dive boats going in and out. Todo bien. I joined them yesterday morning for a tour of the quarry - Rano Raruka - where they built the moai out of tuff - sedimentary stone formed from volcanic ash. Absolutely amazing - one of the most amazing feats of art and engineering you can imagine. They carved them all here, and then transported them to their tribal villages around the island. These things are huge and weight tens of thousands of tons - they used palm trunks and ropes to move them around. 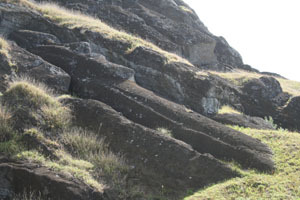 The moai that are still at the quarry are the last ones made - that were never finished or transported to their destination. Nobody knows exacly how/why the age of the moai ended! I finally met up with Luis - saw him on the street yesterday evening, and found him at the stable this morning. He's got thing well under control. There will be 20 riders in the Sunday race - from Chile, Argentina, Namibia and USA - and of course the locals! I'm not sure of the exact disance we'll be riding - I think around 60km - enough to cover most of the island. 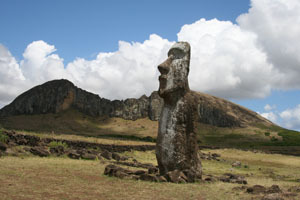 We'll be riding through the National Park - past the moai and ancient villages and along the coast. Can't wait! And the horses are all barefoot! 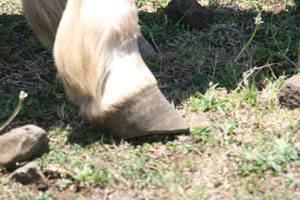 (actually the vaqueros are barefoot too :). This is some of the stoniest land I've seen - the island is basically the highest point in an underwater mountain chain of volcanic eruptions. It's a rock island. I haven't seen the stable horse's feet yet, but I tried to get close to some of the feral-ish horses and their feet are amazing!! I can't wait to look at the stable horses more closely - I'll take some photos. 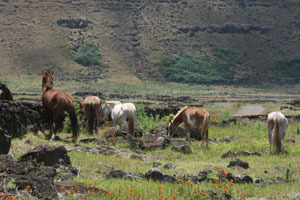 This would be a fun place to study feet - the horses have never been shod, graze on the rockiest places you can imagine - sharp volcanic rock - plus they are ridden - a lot. Should be a lot of similarities with the western USA mustangs. So - I'm going to go get a pizza now- and maybe figure out something to do with S/D this afternoon. This is super cool. 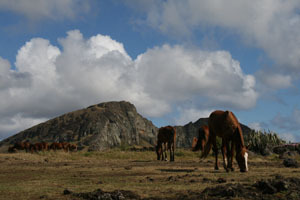 I always wanted to go to Easter Island because it's one of the few remote Pacific island with horses. Can't wait to see how the ride goes! Looking forward to your report on the ride.